Every year I get requests to share the steps I took to build our 2 raised garden beds sitting in our backyard. I figured it was about time to share the thought process and construction notes so others could take advantage of the gift that keeps on giving. They are incredibly easy to make, especially if you have the right tools. If you are lacking the tools, there are many ways to hack it and make it work no problem. If all else fails, call me after acquiring a 6-pack of brew (or at least teach me how to create better sketches on the computer). Now there are about a million ways to make raised garden beds. I will go through what my research led me to do – of course you should change up where it makes sense for you. I’ll give you pointers along the way and all I can really tell you is that my beds are on season 3 and are standing firm like the day we installed them (of course a little more faded). While I built two beds, the instructions and materials below will cover what is needed to make one 4ft x 8ft garden bed like the ones I have created. Garden beds can be made out of a number of different materials, but cedar is most popular. If you are going to use wood, may I highly suggest cedar or another redwood. The reasons for cedar are many, but the main advantage is that it’s naturally rot- and insect resistant. Cedar can be in contact with water for a long time and wear well. Termites are not a problem. Other than weathering very well, it also smells fantastic. Whatever you do, do NOT use treated wood. It contains harmful chemicals used to prevent insects and rot which can leach into your garden beds and veggies/fruits. A true health hazard. After getting the wood home, you will need to cut it up. Of the six 8 ft. flat boards, 4 will remain uncut and 2 of them will be cut in half to create four 4 ft. boards for the sides. Therefore, your new beds will be 8 ft. long and 4 ft. wide. I do not recommend making a single bed longer than 8 ft. First off, the 8 ft board is a common size. Second, you have a greater chance of the boards bowing out in the middle due to the weight of the soil over time. Of course to remedy this, you could put a wood brace in the middle to hold the 2 long sides towards the middle. Another option is an aluminum brace in the middle since it will be covered by moist dirt at all times and aluminum will not corrode. I also recommend not making the beds more than 4 ft wide – the main reason here is because you are able to reach into the middle of the bed easily from all sides (or even from just one side). If you made a large square, it will be hard to pick vegetables from the middle without crawling onto the bed. Power saws or hand saws will work fine. I used a miter saw to get the job done. Since the flat boards are wide, I had to flip the board in order to cut through the whole thing since the blade is not able to contact enough board in one cut. You will not have this issue with the 4×4 cedar posts. As far as the cedar posts, I believe I made 3 posts out of each 8 ft post at 21 inches long for a total of 6 posts (there will be wood left over). The reason for the solid 4×4’s in each corner and the two sides is to make the structure solid so it doesn’t deform or pull apart a few years later. As you can see from my photos, I extended the post below the actual bed so I could have a portion of the posts buried. I thought this would provide extra stability and solidness to the bed as whole, although I’m sure I over-engineered this part – I bet you could get away with not having any remainder board hang out the bottom that would be later buried. *Note: Boards never match their “advertised” dimensions. 2in x 8in x 8 ft boards are actually 1.5in x 7.5in x 8 ft approximately. After all the wood was cut, I dragged a few pieces into the yard to visualize the area they would finally rest once completed. After some eye-balling, I brought the boards back to piece together. From looking at the photos, it should be pretty simple to imagine what to do from here. I simply put the shorter boards on the outside of the longer boards. 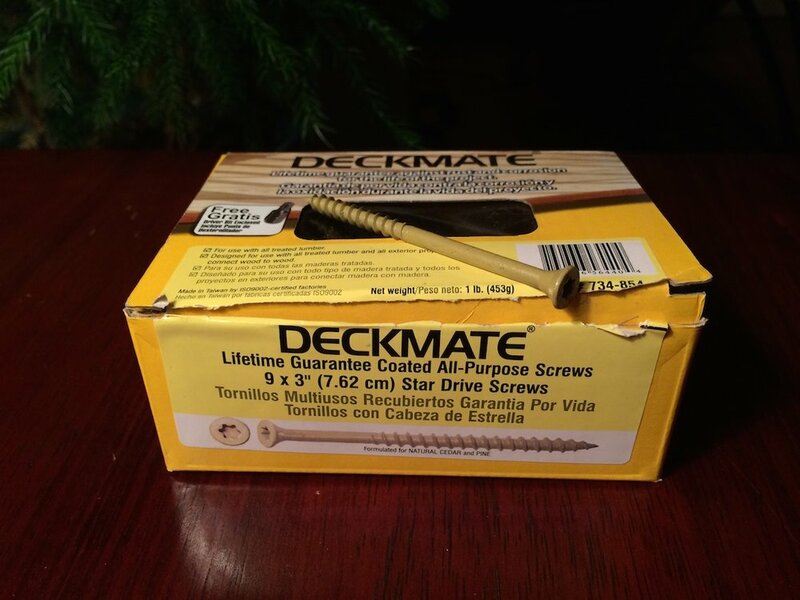 I first drilled pilot holes into the boards that were smaller in diameter than my deck screws (your deck screws should still be semi-tough to screw in…the pilot holes just help prevent the wood from splitting). All you are doing here is screwing 2 deck screws into each spot where a board meets a 4×4 post (again, each of the 4 corner post and then another post centered on each of the long sides seen in photo further down). I used deck screws that were a tan color to match the boards. They are coated and made for outdoor use so there should never be rust. They also use a star-shaped head to help power them in with your drill (the star-shaped drill bit comes with the screws in the box.) Otherwise any phillips-head screw will do. After getting the wood together, I took one final step which was to take a roll of galvanized steel mesh and roll it out under the bottom of the beds and staple down all the sides. The main trick here was cutting all the wire around the posts and making sure there were NO gaps. I even used extra bits of mesh in some areas for reinforcement. The mesh is completely optional – it protects your vegetables from critters that could burrow underneath and eat the roots. I discovered a few vole holes around our yard and decided I wasn’t going to risk it. Your area may be safe and even if you have burrowing wildlife, it doesn’t mean your crops are doomed. You can leave the grass. It will soon be buried in 15 inches of soil never to be seen again – no problem! It’s not going to somehow find it’s way back to the surface. So yes, the final step is indeed the soil. We have a gentleman in the area who runs his own operation with getting soil, mulch, etc for customers so he brought in a few yards (forget exactly how much) of good garden soil. Mix of organic material, manure, sand and peat (to retain moisture) all in one nice compost of rich, black, full-of-nutrient dirt. After 1 year, we had to have him come back with a 2nd small load of soil as the stuff from the previous year settled after awhile which is expected. You want the soil to be about an inch under the top of the bed. Now in our 3rd year, I am happy to say the settling of the dirt is over and we are at good levels. I do not recommend buying bagged dirt for a bed this size – you will need more 40 lb. bags than the average vehicle can handle. We simply put a rug over the edge of the bed and flipped a wheel-barrow of dirt one-by-one over the edge so it would not gouge the wood. That’s about it! We’ve grown tomatoes, lettuce, carrots, peppers, onions, cucumbers and more. We even set up a system of poles along the entire back of one of the beds and use natural-fiber string in long vertical strands spaced a foot a part to allow beans and peas to climb (works with FANTASTIC results). 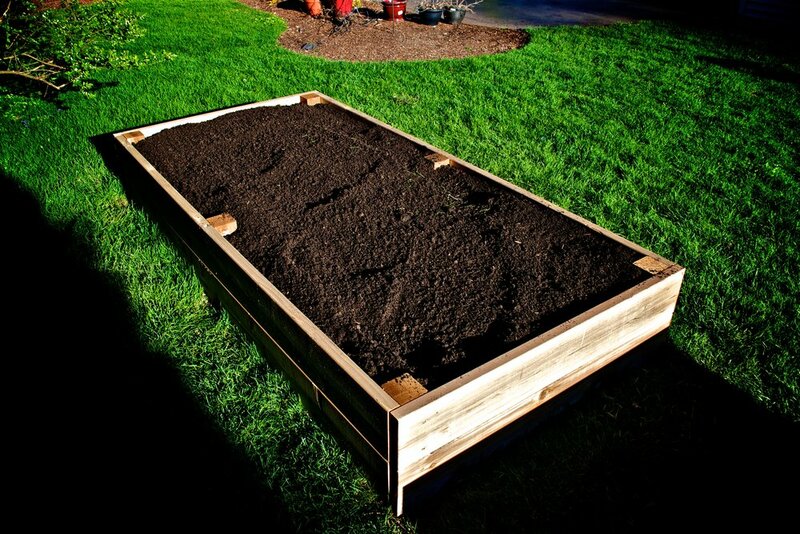 The raised garden beds create great separation from the rest of your yard and allow you to use much better soil than what is probably in your backyard right now. It’s also much easier to till and not accidentally re-compact from walking, etc. Be warned however that raised garden beds to take more water since they drain easier back into the ground. On the hottest days of summer, they MUST be watered everyday. Some people hook in black soaker hoses that sit around the crops for easy watering. I simply place a sprinkler between the two beds that goes back and forth…which brings up another good point. Make sure your beds (if making multiple) are spaced far enough apart to that you can place a sprinkler between the two and the water does not hit the wooden edges. ALSO, make sure your lawn mower will fit through the beds or you are in big trouble. I did 3-4 ft between mine. If you choose to build raised garden beds, you are on your way to fresh, organic produce that you can enjoy all summer. And, I think they are easy and fun to make. Good luck!